Chief economist warns that technology will cause disruption on a much greater scale than the Industrial Revolution. Artificial intelligence could lead to “large swathes” of people being left unemployed, the chief economist of the Bank of England has warned today. Speaking to BBC News, Andy Haldane said that the disruption caused by the technology could be “on a much greater scale than the first Industrial Revolution”. He said that it is important that the “lessons of history” are learned and training given to people to take advantages of the new jobs that, he acknowledged, will become available. “Each of those [industrial revolutions] had a wrenching and lengthy impact on the jobs market, on the lives and livelihoods of large swathes of society,” Haldane told the BBC. He said that this hollowing-out of the jobs market would be on a much greater scale in the future, with machines both thinking and doing, “replacing both the cognitive and the technical skills of humans”. Haldane added that in the future, many jobs would need to focus on human interaction, face-to-face conversation, and negotiation skills. 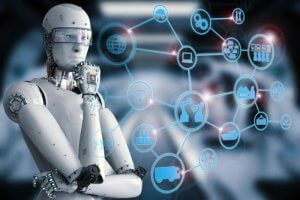 However, Matt Walmsley, EMEA director at AI security provider Vectra, told Internet of Business that the issue of AI’s impact in the workplace is more complex than a simple case of ‘machine in, human out’. “Automation and AI are already happening at a pace that is not going to slow down, and many workers need to be ready for that change,” he continued. “We need to ensure we have programmes in place that assist workers to understand what their role in this future automated world is. But the good news is, there definitely is a role. “There are things that machines are good at, and there are things that humans are good at. Knowing how these two skill sets intersect will provide clarity as to how the future of work looks. Both sides of this debate make familiar points: on the one hand, AI (alongside robotics, automation, and driverless cars) will displace human beings from the economy – and not just in routine or low-skilled jobs, but also in rising numbers of formerly safe, middle-class professional careers. And on the other, it’s not man versus machine, it’s man augmented by AI-enabled skills – a point made repeatedly by technology leaders such as Satya Nadella at Microsoft and Virginia Rometty at IBM, which has refocused its entire business on cognitive services. Both sides are right to say that skills, communication, education, transferrable expertise, and life-long learning will be the real battlegrounds, rather than unemployment in simple terms. However, both sides also miss a critical point. One of the major problems facing the economy is that there is a serious mismatch between what technology companies and researchers believe they are providing – a means to complement human ingenuity and expertise – and what many buyers believe they are getting: a means to slash costs, make workers redundant, and improve productivity, to the benefit of their private shareholders. Survey after survey has found that companies are, at present, primarily implementing these new technologies on cost grounds, and not to make their businesses smarter. And the Bank of England has actually been part of this problem. It has been advising the current government that economic growth and productivity are indivisible, and are effectively one and the same thing, convincing a Conservative administration that the UK’s economic future rests largely in improving its flatlining productivity figures. This has been a problematic distortion in the economy at a time when the government should be investing in AI, robotics, and so on, for their own sakes, to open up new revenue streams and innovative new businesses, rather than merely tinkering with the old. That narrow, almost exclusive focus on cost and productivity among senior policymakers – while important, of course – is actually a colossal failure of vision. The post Bank of England warns of industrial-scale job losses from AI appeared first on Internet of Business.